The morning paper has a story about a man who found his dream job. Rob Szpak was dazzled by a police dog when he was a kid, and now he runs the kennel for the Vancouver PD canine unit. Not everyone loves their job. For centuries most people's work was too hard to love, and the hours too long. Now you meet many people who find meaning and fulfillment in their employment. Even social life can center on the workplace. I hardly ever hear anyone point to the number one reason for going to work: to pay the bills. To support yourself and your family. The primary reason is almost in the background. The same goes for a house. Until modern times, only the rich saw their homes as places of gathering, of comfort and of status. For the vast majority, a house kept out the rain and sheltered from the cold. Now, we hardly think of those primary functions at all. And, I am afraid, the same goes for the Church. We can focus on what is secondary to its mission, and ours. Parishes today are places of community, education, good works, and social life. The Church itself teaches wisdom on a host of subjects, ranging from the environment to family life. All good--indeed very good. But might we sometimes lose sight of what's most important of all, of the central reason and purpose of the Church? Let's test this out. I'll give you a few seconds to answer the question in your head. Why do I go to Church? What does my faith offer me? I'm sure there are many good answers. But the perfect answer can only be "eternal life." That's the answer our two catechumens gave during the rite that accepted them as candidates for baptism. Today's Gospel puts aside all the good reasons to be Christian and reminds the catechumens and every one of us of the number one reason: to live forever. When's the last time you thought of that? Whether you are a young and healthy person, or a very old one with serious health challenges, in today's Gospel Jesus promises you the one thing that matters more than everything else: "Those who believe in me, even though they die, will live, and everyone who lives and believes in me will never die." The death of Billy Graham last month was front-page news. His preaching was fairly simple, and reached its climax with one question: "will you accept Jesus Christ as your personal Savior?" 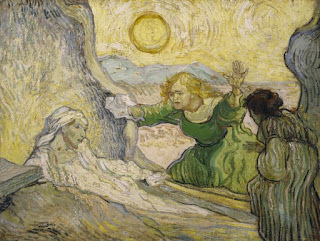 If you asked "Savior from who or what," Billy Graham might well have read you the story of the raising of Lazarus, in which Martha receives the promise of salvation on behalf of all of us. And if you asked, "how do I know? ", the famous evangelist could then have pointed you to what Jesus tells Martha : "I am the resurrection and the life." How do I know I will rise from death to live forever? Because Jesus rose first. This is our Q and A for the fifth Sunday of Lent. The Church invites those preparing for baptism--and every one of us who are already baptized--to turn to the fundamentals of faith. It takes a long time to listen to the whole story of the raising of Lazarus, but only a sentence to sum up its lesson: Jesus promises that all who believe in him will live forever. When he makes that promise in Bethany, he secures it with the rising of Lazarus. And when he makes the promise to us and all the world, he secures it with his own resurrection from the dead. This is where a short homily would end. And it will, at the 11 o’clock Mass when we celebrate the third and final scrutiny with our two catechumens. But we have a little extra time, so let me add a secondary point. We might ask ourselves why we fear death so much if we really believe that Jesus has conquered it. Do we lack faith? The Gospel this morning doesn't suggest that Christians are supposed to laugh at death and deny its pain and sadness. We were created to live--as we know, God's original plan did not include death. So death remains something we naturally resist, even if our supernatural faith is strong. Don't we see this in the tears Jesus sheds for Lazarus? Don't we see this in the tears he sheds in the Garden of Gethsemani? Christ weeps not only about his passion, but about his death itself, despite his complete faith in the Father. Shortly after the raising of Lazarus, Jesus contemplates his "hour," the hour of his death, and he says "Now my soul is troubled" (Jn. 12:27). And the Letter to the Hebrews says that he "offered up prayers and supplications, with loud cries and tears, to the one who was able to save him from death" (Heb. 5:7). Our faith in Christ's resurrection, and in our own, gives us all we need to face death and sorrow with courage and hope; but it does not eliminate the sadness of death until we dwell in the heavenly city where God will wipe away every tear and "death will be no more" (Rev. 21:4).